Enlarge / Who’s a hungry frog? Gnog doesn’t ask much of its players. The pastel puzzler is easy on the eyes and easy on the pocketbook. It doesn’t last long, either. You can knock the whole thing out in a couple of hours or less. Its puzzles consistently capture the satisfaction of fitting a square peg in a square hole without much challenge to speak of. It is, put simply, one hell of a chill time. Put less simply, Gnog a game about manipulating 3D puzzle boxes in the form of cartoonish floating heads. Each diorama tells a pseudo-story and ends with the constantly changing “face” crooning a little ditty. I found it hard not to bob my head alongside the colorful creatures. That’s especially true when playing in virtual reality. Those faces feel present in VR in a way that 2D screen representations can’t match. Every head is carved from soft-edged, chalk-bright colors. It’s a friendly, welcoming sort of surrealism that only gets more charming as you peel away each layer. If a tiny being inside a head is sad, odds are your puzzle solving will make them happy. If background music is discordant or an object is out of place, you’ll probably set things right by winning. And the happy little songs at the end of each stage feel like precisely the kind of small, pleasant reward each small, pleasant level should end on. That general pleasantness also applies to the manipulation of knobs, dials, switches, buttons, and various other devices that fill out each puzzle. Anyone familiar with The Room games or Amanita Design’s output (like Machinarium and Botanicula) will recognize the objective. You’re presented with things to fiddle with, so you fiddle, constantly, until the guess-and-check methodology makes the correct order of fiddling clear. Gnog‘s levels all carry themes that tell tiny, surreal stories as you progress. Nearly every puzzle in the game is a makeshift “face” that you manipulate. Eventually, the puzzles open up to reveal increasingly elaborate dioramas. Soft edges, pastel color, and cutesy design go a long way. The first level is very simple, but things can get slightly complicated toward the end. Every puzzle resolves in a small musical number with your newfound friends. VR makes the game feel a great deal more tactile and personable, but you can play in 2D as well. The game is charmingly “pleasant.” You just want to make everyone happy! Gnog is short, but nearly every moment feels well-crafted. 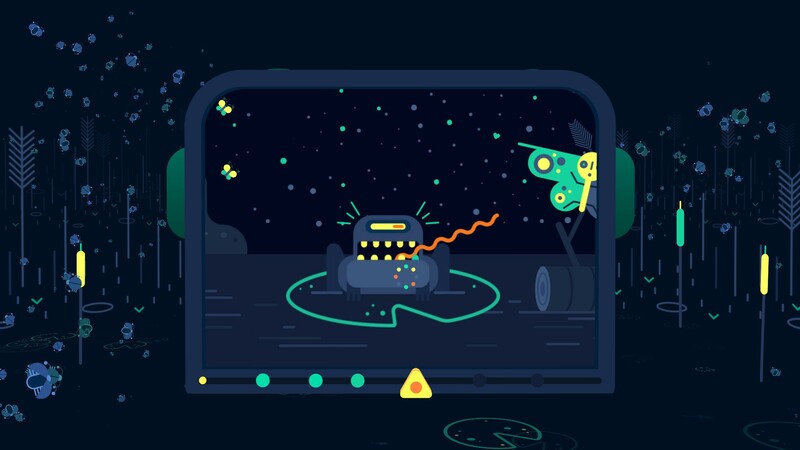 Unlike those slightly similar games, though, Gnog’s puzzles aren’t interconnected. The abstract faces you interact with are separated into nine stages. If you already knew how to complete each level ahead of time, you could easily knock them all out in under 30 minutes. So much of the game boils down to determining what can be manipulated in the first place. There’s a charming flow to this. Even things that can’t be directly manipulated, like a puzzle face’s colorful, tombstone teeth, respond to your virtual touch. Xylophone chimes and friendly grunting follow. The feedback also typically carries a theme—just like the levels themselves. The first is a surreal toad’s giant head, for instance, and the melody of a swamp at night can be heard chirruping in the background. Another stage is a living house inhabited by two hungry residents. Solving it means flipping back and forth between a dining room scene inside the domicile and its outer “face.” Like most puzzles in Gnog, its “eyes” were actually dials that affected different parts of the level, with clues on the opposite side indicating how to set those dials. The whole back-and-forth eventually cooked meals for the happy inhabitants and let the final piece of the puzzle fall into place. Slowly, even for its short run-time, Gnog builds on these ideas, letting puzzles eventually become more elaborate. More solutions to different steps are hidden in the environment rather than revealed just by pressing every in-world switch that responds to your touch. The game doesn’t ever get really hard, but it does require some careful observation at points. You might need to know which pattern of buttons to press on a chocolate bar keyboard, for instance, but said solution will be visibly “hidden” in the environment. The one thing I found frustrating was not knowing how to manipulate certain pieces at a glance. Gnog is a simple game. It doesn’t need a detailed tutorial, but the game doesn’t explain the kind of VR hand motions it requires at all. That’s why I found myself stuck on one early puzzle involving a valve. I knew the valve needed to be turned. I did not, however, know that it wanted me to twist my wrist as if using a screwdriver—not the most precise or comfortable gesture to perform with touch controllers to begin with—rather than move my hand in circles. That’s an exceptionally minor bump in the road to revealing each puzzle’s secrets, though. And that’s the second half of what makes Gnog so enjoyable. All the animal satisfaction at pressing buttons and watching something happen in the world wouldn’t matter if that “something” wasn’t interesting. Luckily, in Gnog, it’s always fascinating. The short length might also play into that cheerful triviality. I beat Gnog in a single sitting, and somehow that just feels right. The game finds its happy medium between objective-based puzzling and the passive VR “experiences” that flood the headsets’ marketplaces, then ends without wearing out its welcome. I would be happy to play more Gnog in the future—either in the form of DLC or a comparably sized sequel at the same $ 9.99 price point—but this particular experience felt complete on its own. The half-mood piece, half-puzzle-box opener doesn’t ask anything of the player, except to enjoy it. So that’s exactly what I did for as long as it let me. Easy, satisfying sense of opening mystery boxes. Realizing just how bad my upper body strength has gotten while using my Oculus Touch controllers. Gnog is an extremely relaxing game about fiddling with surreal puzzle boxes. Its short length is well worth the price of admission. Buy it.